The North American Film Awards has been scheduled to take place in July in New York. The North American Film Awards (NAFA) 2017, which is organised to honour the best movies and performers of Malayalam movies, is set to be a star-studded event this year. The organisers of the second edition of the award show have declared the winners in various categories. While Nivin Pauly has been selected as the Best Actor for his performances in blockbuster movies Jacobinte Swargarajyam and Action Hero Biju, Manju Warrier will be awarded the Best Actress of the year for her films Karinkunnam 6s and Vettah. Fahadh Faasil's family entertainer Maheshinte Prathikaram has bagged the maximum number of awards, including best movie, new sensational heroine (Aparna Balamurali), comedian (Soubin Shahir), debut director (Dileesh Pothan), screenplay (Shyam Pushkaran), music director (Bijibal) and cinematographer (Shyju Khalid). Meanwhile, Nivin's realistic entertainer Action Hero Biju, which has been selected as the Popular Movie of the year also bagged two more awards -- Best Singer (Vani Jayaram) and Character Actor (Joju George). Tovino, who has won the New Sensational Hero award thanked NAFA and all the cast and crew of Guppy, for which he was well appreciated by the audience. Thank you NAFA :)Dedicating this award to my dearest Chethan Jayalal Johnpaul George Girish Gangadharan C.V. Sarathi E4entertainment and the whole cast and crew of GUPPY ! Congratulations to all the award winners !! 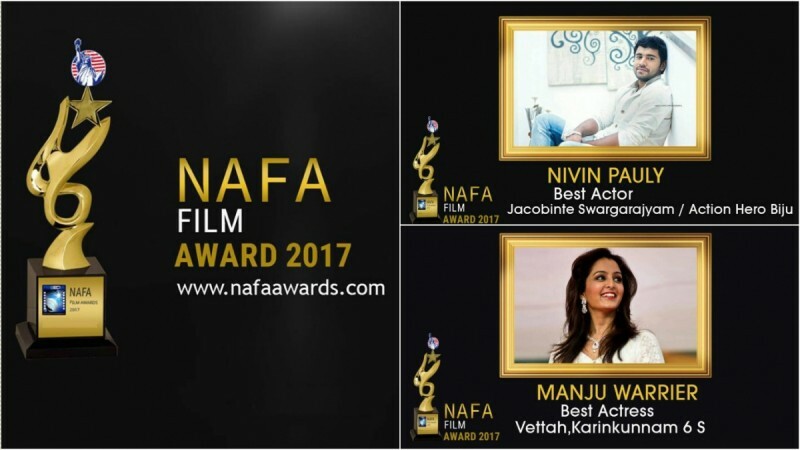 NAFA 2017 will also see the presence of Biju Menon, Aju Varghese, Vinay Forrt, Renji Panicker, Asha Sarath, Neeraj Madhav, Abrid Shine, Rajeev Ravi, Unni Menon and Vinayakan, who have also won awards in different categories. Presented by Freedia Entertainment, NAFA 2017 will be held on July 22 in New York.